today i have a bit of this and a bit of that—not really anything that makes a coherent story. oh yeah, but we’re talking about me and my knitting so chaos is status quo. first of all, HAPPY BIRTHDAY to my two nephews, james (28) and daniel (11). much as they may chafe about sharing a birthday, they are each uniquely special to me. i marvel at the admirable, arian qualities they share (great sense of humor, gregarious personality, self-assurance, ease in conversation) and delight in the differences that set them apart (daniel has a beautiful speaking and singing voice, james is a veritable arsenal of information about comic book art and artists). i finally scored a skein of the right dye lot of ranco to finish my school socks, though it doesn’t match all that well, unfortunately. i know. i should rip back and intersperse the old with the new so that the transition is nicer (why didn’t i think of that at 1am??). of course i should, and curse me for not doing that to begin with. 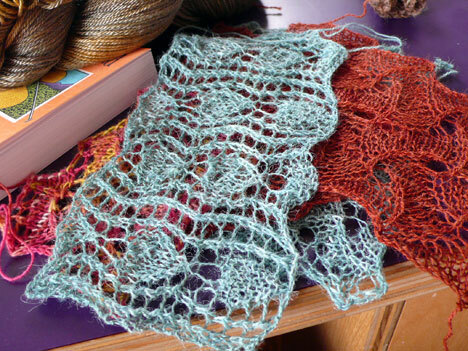 but i also want to have these off the needles—like now—so i’m waffling (can you believe the laziness??). why am i not willing to go back and fix it when i am happy to do in more complicated circumstances for less obvious reasons? ahhh, the eternal question (hmm, maybe the answer is in stephanie’s new book). but then, what an inbox, right? who wouldn’t want this to be their workload for the next little bit? i really am very lucky, and because of that i should fix the sock, right? oh, and i’m not a virgin any more—i’ve finally broken into one of the STR sample skeins i have, to continue my exploration of how best to use very dark colorways in socks. this is one of the raven clan samples tina sent me last summer; i’m not exactly sure which one (it was marked only by number), but i’m thinking it’s haida, or an early version of it. i know this little bit of a sock tells you nothing, but all will be revealed in good time. 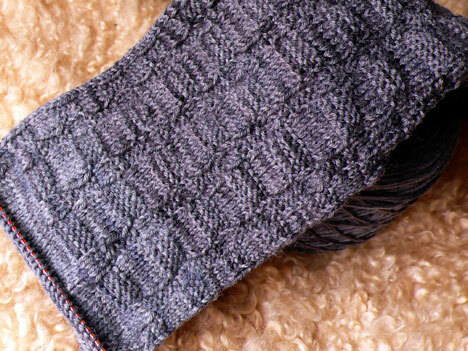 this is a test skein of a new sock yarn that deb is thinking of adding to her fearless fibers collection. it’s a merino/tencel blend and she’s really excited about it. 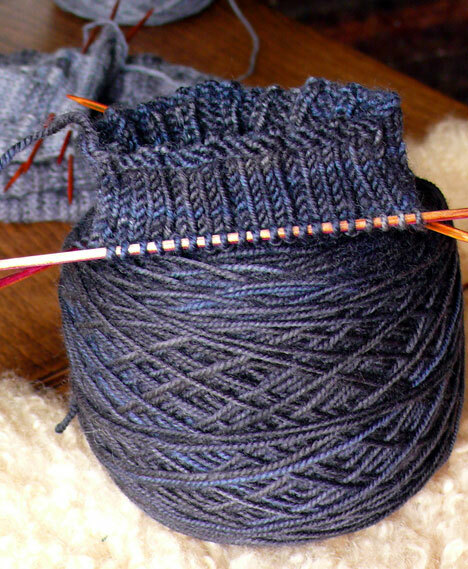 i’m going to try it out, either in a sock or in a scarf or maybe even mitts. 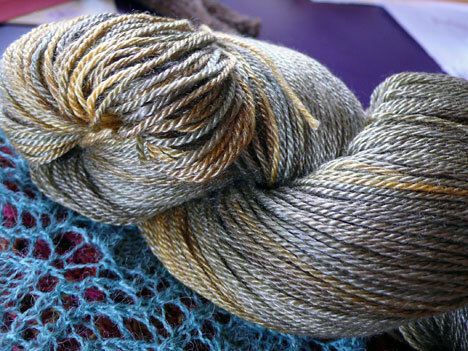 it’s an interesting colorway with lots of rich gold. hmm, yes, i could see doing some mitts in this—they would make one’s hands look like they were sheathed in precious metal—it could be really nice. while at the same time being determinedly stuck in 30-degree cold. 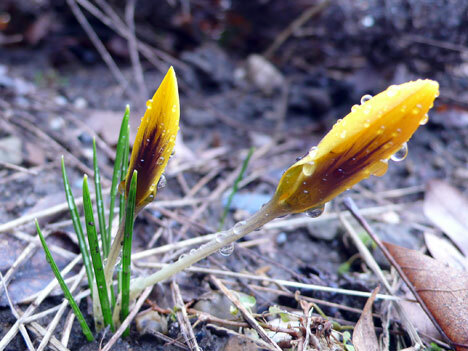 these crocuses had half-opened the other day in a tentative testing of the spring sun, but have snapped themselves up tight against the chilly wind and rain today. 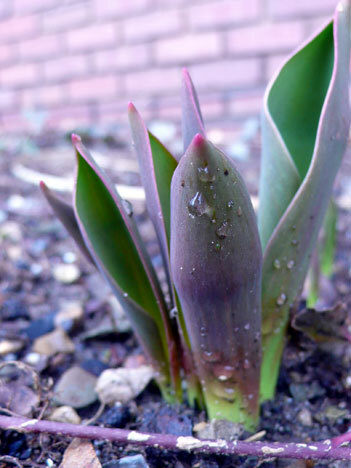 our first tulip has broken ground in a hardy surge toward its goal. The school socks have a cool fade-in fade-out effect going on. I like it. It’s not a bug: it’s a feature. knit up those not matching socks and overdye them, maybe? i say just keep knitting, if socks were meant to be perfect then we wouldn’t put them on our feet! I wish that were MY inbox…sigh. I can’t wait to see what you do with it all! Deb made a really good use of the shine in that yarn! It would indeed be lovely as mitts. So many beautiful things going on here…..especially the greenery! Great inbox! I hope you get some nice spring weather for you and your flowers! I don’t blame those crocuses one bit for staying all shut up. 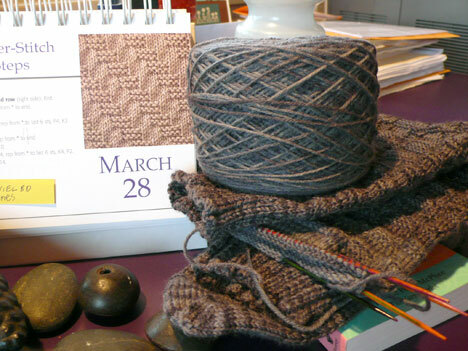 Gee, I hope you’ll reconsider about knitting a sock from Deb’s blue-gray and gold merino/tencel yarn. Mitts and scarves don’t do anything for me –perhaps it’s because I live in California 🙂 — and winter is almost over, anyway. I didn’t notice a color change on the socks… plus they’ll be covered by pant legs. I feel like your tulip — I stand in the sunlight but it is just toooooo cold! The colors of the precious metals yarn and the raven socks are only eclipsed by the colors of the amazing tulips. And don’t the leaves look like they have tiny eyes with pink noses facing skyward? I have to say that I like what’s in your inbox, much more so than in my actual work inbox. So many pretties, so little time. I wish my inbox looked like that. I like that Fearless Fiber new color!! Hey there! You may not have noticed my absence in the comments lately, but I’ve been away (I was in Japan!) and haven’t been able to read your blog in a bit. But I’m ba-aaaack! And I’ve missed reading you (I’d almost forgotten about your enabling!!! Nice stuff! ).